Rewards and recognition also play an important role within the engagement equation. One must however be extremely careful in leveraging this component as Maslach et al. (2001) suggest that while a lack of rewards and recognition can lead to burnout, appropriate recognition is important for engagement. [i] The leveraging equation depends on the emphasis of well-being and employee benefits. Lambert (2000) and then Muse, Harris, Giles and Field (2008) showed that benefit and recognition use, depended on the perceived value and were positively associated with important work behaviours. [ii] Therefore, since people are motivated and engaged by the opportunity to obtain rewards, utilize aspects like increasing praise within a work environment, showing more appreciation and thanks, smiling, while creating an environment full of small easily won rewards is a first step. Distributive and procedural justice allows organizations to be predicable and consistent in regards to rewards as well as the procedures they use. One justice refers to an individuals’ perceived fairness of the means and processes used while the other refers to the perceived fairness of the distribution of resources (this aspect will become especially important when we look at the 2011 BlessingWhite results of employee engagement survey in another post. The employees who have a high perception of fairness of these two concepts are therefore more likely to feel obliged to be fair in how they perform in their roles. The remainder of employees will disengage from their work roles. Thus, organizations who wish to improve employee engagement should focus on employees’ perceptions of the support they receive from their organizations. [ii] Muse, L. Harris S.G. Giles W.F & Field H.S (2008) Work-life benefits and positive organizational behaviour: is there a connection? Journal of Organizational Behaviour 29 171-192. Wiley InterScience. Various implications exist as a result of organizational behavioural aspects, Kahn (1990) and Maslach et al’s (2001) looked at the antecedents within their models that are necessary for engagement. The core of the model depicts two forms of employee engagement: job and organization engagement. 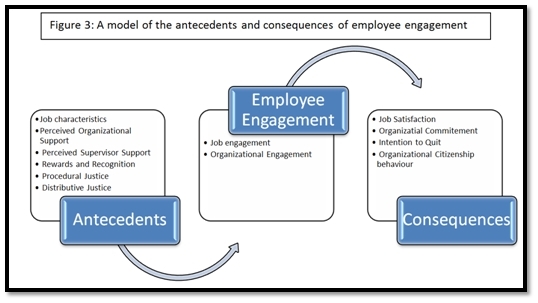 [i] Combined these viewpoints with the Social Exchange theory (SET) create a model of antecedents and consequences for employee engagement. Figure 3, depicts nine hypotheses that endeavour to explain employee job and organizational engagement; key findings include implications on overall employee engagement and organizational profitability. It finds that employee engagement can be understood in terms of SET and that a relationship between job and organization engagement exists but they are distinct constructs. The following research then holds true: Job characteristics refer to the meaningfulness and sense of return an individual has within the self-in-role performances. Kahn (1992) argues that this meaningfulness can be achieved through challenging work, variety of work, the use of different skills and personal discretion while making important contributions to the business. Therefore, jobs that are high on core job characteristics (skill variety, task identity, task significance, autonomy and feedback) will provide the incentive for an employee to bring more of themselves into the work and therefore be more engaged. SET would indicate that employees who are provided enriched jobs feel obliged to respond with higher levels of engagement. People are generally apt at finding meaning in what they do. Employees want to believe they are spending their time valuably. It becomes the organizations responsibility to support meaningful work and make it clear why a particular task is important to them. If possible organizations can take another step in trying to adjust roles so that the job fits the person. This will minimize the time that employees spend struggling in a task for which they have no aptitude, while turning their strengths into talents allowing them to bring forward their ‘best self’. Perceived organizational and supervisor support involves a sense of being able to show oneself within the organization without negative consequences. This also increases one’s voice within the organization. Supportive and trusting relationships within an organization will allow the company to provide safe work environments and provide further opportunities for employees to try new things without the fear of consequences. Perceived organizational supervisor support, ties in closely with available on the job resources and support from colleagues. If an employee has the belief that the organization and his/her co-workers care about their well-being, the employee in return will care about the welfare of the organization striving to meet its goals and objectives. Schaufeli and Bakker (2004)[ii] found that a lack of social support has been tied to burnout negatively affecting employee engagement. In a similar way the lack of supervisor support negatively affects employee engagement. Under these conditions the statement “Employees leave people they work for and with rather than the organizations themselves” rings resoundingly true. First line supervisors are therefore especially important for building engagement and are the roots of employee disengagement. (Bates, 2004, Frank et al, 2004). [iii]Consequently, management should analyze what resources and benefits are most needed by employees so that they yield a higher level of employee engagement within the organization. 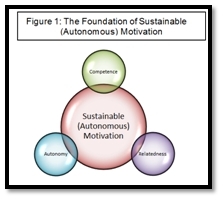 Self Determination theory (SDT) states that autonomous regulation and therefore employee engagement is based on satisfying basic psychological needs for competence, autonomy and relatedness. Human are inherently motivated to grow and achieve and will fully commit to and engage in uninteresting tasks when their meaning and value is understood[i]. Research shows that lack of satisfaction leads to poorer performance and reduced physical and psychological well-being. (Ryan & Deci, 2000)[ii] The theory expands beyond the notion of work motivation and embraces a model of multidimensional concepts where the behavioural implications are measured within the framework of in-role performance but also within discretionary and atypical performance. Competence is the belief that the employee within the organization has the ability to influence important outcomes. Relatedness is the experience of having satisfying and supportive social relationships. Autonomy reflects on the ability of the individual to have a sense of choice and self-determination when completing the task. 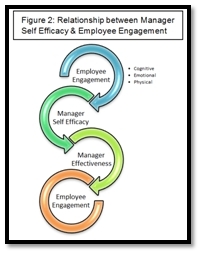 Since this model is rooted in the actions of another individual, such as a manager or an executive within the company, it is necessary to look at the impact manager self-efficacy and manager effectiveness has on employee engagement within the self-determination theory. A recent meta-analysis conducted by the Gallup Organization showed that the most profitable work units have people doing what they do best, with people they like, and with a strong sense of psychological ownership for the outcomes of their work. (Harter, 1999)[iv] One can interpret that this empirical evidence as a significant predictor of employee engagement and desirable organizational outcomes such as customer satisfaction, retention, productivity and profitability. The manager is an advocate of the company who would ensure enduring autonomous motivation of his / her work team however he/she must also be empowered and have self-efficacy in order to increase this performance. Physiological / Psychological Arousal – Strategy development for higher level jobs. [v] Luthans F. & Peterson S. (2001) Employee engagement and manager self-efficacy. Implications for managerial effectiveness and development. Journal of Management Development 21,5. [vi] Stajkovic, A.D and Luthans F (1998b) “Self-efficacy and work-related performance: a meta-analysis”. Psychological Bulletin, Vol. 24, pp.240-61. HR’s universe is expanding as the world of work rapidly evolves. HR’s future means managing an increasingly mobile and diverse workforce, using technology to coordinate workers around the world and building a high-performance talent pool that competes against all comers from all corners of the globe—all while ensuring work/life balance. HRPA invites you to its 2012 Annual Conference & Trade Show to share discussion and dialogue around our common future. Join us as we explore The Future of HR: 2012 and Beyond. Today’s businesses focus a great deal of attention on employee engagement as its consequences are said to be far reaching on the success of the business. It has been reported that roughly half of the world workforce is not fully engaged. As a result this leads to an “engagement gap”[i] that costs organizations over $300 billion a year in lost productivity (Bates, 2004, Johnson, 2004; Kowalski, 2003). [ii] This concept closely ties various related constructs of organizational behaviour. The next few posts will depict various key components which create a model of employee engagement and motivation within organizations. They will draw on concepts of self-determination theory, self-efficacy theory, social exchange theory and engagement models. It is simply not sufficient to apply over-learned carrot-and-stick motivational strategies in today’s complex organizations. These findings will then be compared to real work global findings in employee engagement processes. Is there a best practice global model of shared ownership that can be proposed for future enhancements within organizations? How Human Resources can utilize positive organizational behaviour to build virtues that enable the organization to thrive? Employee engagement, although not referred to as such in the earlier decades was reflected in Marx and Durkheim’s work. Marx argued that the deskilling of labour would enhance control over workers in the labour process[v], this lack of individual control over their own work and lack of autonomy, is closely linked with job dissatisfaction and disengagement. Durkheim’s (1964) work on the other hand focused on a “collective conscious” and the impact that division of labour, class conflict will create a breakdown and alienation of collective of work processes. This breakdown leads to “personal consciousness”, breaking down the organic solidarity within the workplace. [vi] As a result, Joanne Woodward (1958, 1965) and Robert Blauner (1964) argue that the widespread adoption of mass production technologies lead to worker alienation. They also note that there will be a loss of sense of identity through work, giving rise to impersonal bureaucratic workplaces. [vii] These impersonal bureaucratic workplaces led to isolated-ness, meaninglessness, estrangement, powerlessness, work overload, stress and fatigue. As institutionalism changed over the years researchers discussed engagement based on two components, motivation and job satisfaction. [iv] Towers Perrin and Mercer HR (Gallup-12) accessed March 17th 2011. [viii] Herzberg, F. Mausner, B. and Snyderman, B.B (1959). The Motivation to Work, 2nd ed. John Wiley & Sons, New York, NY. Furnham, A. Eracleous A, Chamorrow-Premuzi T (2009). Personality, motivation and job satisfaction: Hertzberg meets the Big Five. Journal of Managerial Psychology Vol.24. No. 8, 2009. [ix] Meyer, J. Gagne M (2008). Employee Engagement From a Self-Determination Theory Perspective. The previous two posts on mentoring briefly looked at the history, organizational impact and influence a mentor has on the success of a professional relationship. For an employee, mentee or protégé, it is a process of skill, competency identification and development. At the conclusion of the relationship it should yield and highlight the mastering of new skills. Mentoring however, goes beyond the realm of professional development. It is a powerful tool for networking opportunities, gaining exposure to different aspects of one’s organization and profession while increasing visibility. As an HR professional and as an employee I have been a witness to how mentoring is an invaluable asset promoting growth during my career. I have been blessed by highly skilled, knowledgeable and willing mentors both within my academic experiences, workplaces and peers. Mentoring is not only a process where senior executives and company owners contribute to the growth of an employee – it is both a formal and informal process that shapes the successes of all individuals. I have reached out to teachers, bosses, co-workers, subordinates, association members and friends in order to help capitalize on the vast amount of knowledge they possess. Understanding that those around you can offer constructive criticism only broadens your learning experiences beyond one field, aspect or category. Mentoring can also allow you to learn from experiences of others and avoid costly pitfalls, while teaching you how to tailor your own style into various situations. Mentoring can also provide a beneficial experience and have a significant impact on the mentor themselves. Individuals who enjoy mentoring describe it as a process by which they are motivated and which allows them to share or teach other the valuable knowledge they have learned. Mentoring does require one to take time out of their schedule. Mentoring may also seem like a lot to bite off when one is trying to juggle many competing priorities of one’s job and life; however there is a significant return on investment when one spends their time mentoring. …has an appropriate motivating ATTITUDE in the way they communicate and share information. …reciprocates the MUTUAL feelings of the two parties involved in the relationship. The two become fundamental blocks and stakeholders that will establish a pathway to success. 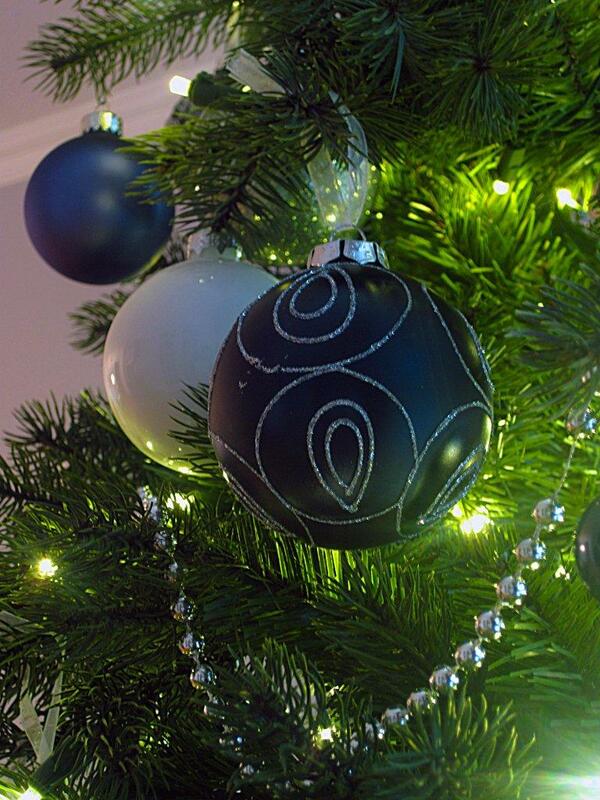 …is passionate about the work, the company, its success and has a STORY to tell that provides a clear message. The mentor first priority in building trust is to establish honesty; this trust will be effectively used to listen to the concerns and comments of the mentee while building further rapport. It is important to remember that the mentee looks up to the mentor and will be looking for guidance relating to all issues and options available to them throughout this partnership. The cooperation of this working partnership should provide various strategies and tactics that should then be incorporated into a process of increasing productivity and revenues for the organization. The mentor establishes a network that benefits the business and builds a strong brand for the organization in terms of corporate and organizational learning but also establishes himself /herself as a key leader in forming and educating the future leaders of the organization – a wonderful accomplishment to be proud of. It is important for everyone to assess the role they can play within a mentoring environment. Often times, individuals will not volunteer to be mentors unless approached and asked directly. Everyday this talent is wasted within our organizations. A talent that if harnessed can add depth to the individuals role and their commitment to the organization. It can also be argued that the mentor leaves behind a legacy for all future candidates that carry on the knowledge through the ages. This underutilized tool within our workplace can be a fundamental aspect of on-the-job learning as more natural attrition takes place with retiring baby boomers in our workforce. It is not an easy program to establish but the benefits are clear. Motivation is one of the most discussed topics in today’s business world and has been proven to have a huge effect on performance. We talk about fitting people into organizations when we hire individuals. We can spend large budget amounts to recruit the “right individuals” but rarely do we tailor programs to suit the candidates which are already in the system. Frederick Herzberg published his findings in the 1959 book The Motivation to Work. Herzberg “HYGIENE MOTIVATION THEORY” addresses 6 main factors that affect satisfaction and dissatisfaction within organizations. Herzberg continues to write that factors causing satisfaction are different from those causing dissatisfaction; they are not opposites of each other. There are intrinsic and extrinsic factors that lead to satisfaction. To this day the Herzberg theory is routinely criticized .This criticism is based on the notion that it is natural for people to take credit for satisfaction and to blame dissatisfaction on external factors. Despite some of its downfalls there are many implications that management needs to be aware of when motivating employees. The statistics can have devastating effects on the workforce. It is important for everyone especially those who help form policies within the organization to consider the motivating factors for each different group. As an HR Professional there are many spectrums of alignment we must look at; alignment of HR strategy to the corporate strategy, alignment of budgets, alignment of goals and actions plans but also the alignment of the needs of Human Capital in order to foster their growth and utilize their capabilities and potential to the benefit of the organization. As the organization establishes methods of motivation and reward they will be better able to attain above average performance as outlined in a previous post. Mentoring is one core functional aspect organizations try to apply in order to engage in corporate learning, foster relationships within the organization and provide key performers ability to access otherwise out of reach opportunities. The next few posts will depict varying aspects of mentoring skills, characteristics and benefits to all stakeholder parties. The first of these posts will attempt to portray my viewpoints on the highly discussed origins of mentoring rooted in The Odyssey. It is not an attempt to prove or disprove the significance of Mentor’s role in relation to Homer’s journey. Mentors are regarded as role models, counselors, trusted advisors, teachers, nurturers, friends, challengers, encouragers and sponsors. Therefore their ability to influence other individuals’ performance and outlook form a substantial part of how the next generation of leaders progress throughout their careers. Mentor in Homer’s Odyssey was a protective, guiding and supportive figure who acted as a wise and trusted counselor to Telemachus, son of King Ulysses. This notion was also depicted in Les aventures de Télémaque (The adventures of Telemachus) by Fénelon, Archbishop of Cambrai. This book is arguably the most controversial piece of literature depicting the roots of where Mentor’s acclaimed reputation is displayed. Whether one attributes the characteristics to be displayed within The Odyssey or Les aventures de Télémaque, businesses have utilized the concept of “Mentoring” as a valuable tool. Mentoring today has grown to complete processes and structures within learning organizations. They form the core values by which organizations try to govern. They allow various succession planning processes to play into the growth of their employees, which unabatedly affects talent retention, motivation and the future success of organizations along with knowledge retention. In short; A mentor acts as a counselor and provides advice on career paths, development opportunities, and an overview of what it takes to become a leader in the company. Typically, a mentor is a senior manager, at least two levels above you in the organization; someone with broader experience in the company who can open doors to otherwise out-of-reach opportunities and thus helps you achieve your professional goals. Mentoring fosters the personal and professional learning and development of both protégé and mentor as well as helps enhance organizational learning. Electronic mentoring, also known as tele-mentoring, is a concept that is gaining a great deal of attention in the mentoring community. Simply defined, e-mentoring is the use of technology (often email) to facilitate and/or support a mentor/protégé relationship. 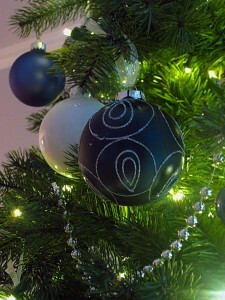 A Happy, Healthy, Prosperous, and Blessed 2011!